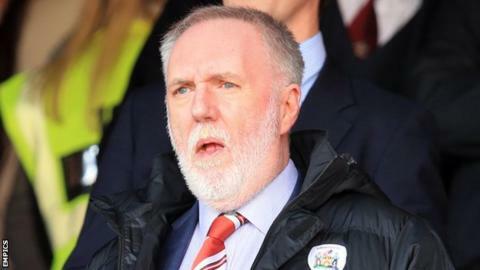 Terminally ill Barnsley owner Patrick Cryne has written a poignant letter to the club's fans. Cryne, who has cancer, wrote a piece for the club's programme for the EFL Cup second-round tie against Derby, which the Reds won 3-2. The 66-year-old has been in charge at Oakwell since 2004. In the article, Cryne revealed that he is "living on borrowed time" and thanked fans for their "kindness down the years". "I am living on borrowed time. I live in pain, but living is better than the alternative. Cancer is insidious, cruel and rapacious and I implore everyone to have regular checks to stop it gaining hold. "Recent months have brought into focus the things that are important to me. I have spent a lot of my life pursuing the ultimately pointless when there were better things to do. My family have always been important to me but I should have spent more time telling them so. "I do now and it creates joyfulness in our relationships. Of course, my football club has been important too and I am lucky that my family have shared my love of Barnsley FC. "For much of the time since I became the club's buyer of last resort, I allowed others to run the club, fearing that I did not know enough to win the respect and supporter of the 'football people'. It is ironic therefore that we enjoyed one of our most successful periods when I did take up the mantle ending in two successful visits to Wembley. "Maybe, one day before too long I will tell the secrets of how we did it. Certainly, the whole club working as one was instrumental. I don't know if we will ever repeat the sense of togetherness of that season, which extended also to the fans, their tolerance and incredible support. "There are many things I wanted to achieve before my custodianship of our fabulous team ended at the hand of the Grim Reaper. Of course, I wanted to see us get back to the Premier League and make some enhancements to the iconic West Stand. On a personal level, I wanted to bring back together all the 1912 FA Cup final medals, but I only managed to retrieve five. "Most people realise I was a reluctant custodian but what has made it bearable against the occasional cruelty of the internet world is the kindness shown to me by so many fans on a personal basis. "People are not shy in coming forward and telling me they appreciate my efforts, even if I have fallen short of their aspirations. I receive many letters and cards from fans who share with me their memories and best wishes. I am grateful to them all. "Regarding this season, I think we will get stronger as it goes on and our team gels, not unlike the double Wembley season. I do not expect to live to see the ultimate outcome, but I travel in hope. "I wish you all a good football season and thank you for your kindness down the years."